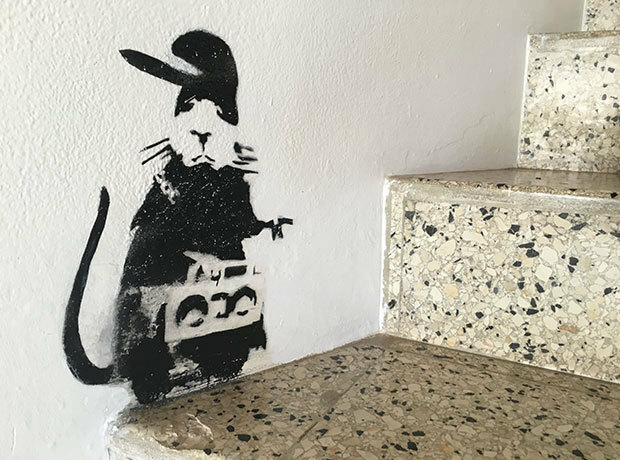 In March 2017, numerous wall works by Banksy were inadvertently destroyed while on view at the Geejam Hotel in Jamaica. According to reports, Banksy had stayed at the hotel in 2006, leaving 11 stenciled pieces throughout the property as a gift to the owners. Ten years later, building workers overseeing repairs to the hotel mistook the works for graffiti and painted over many of the pieces. The hotel owners were “mortified,”; while a company was called in to survey the damage, and are understood to have suggested a paint-stripping service at a cost of around £120,000, the pieces were deemed damaged beyond repair.